Becky Flitcroft, USFS, teaching about aquatic insects. What can be more magical than getting kids outdoors to see salmon spawning in the wild, while learning about stream ecology, geography and natural history? 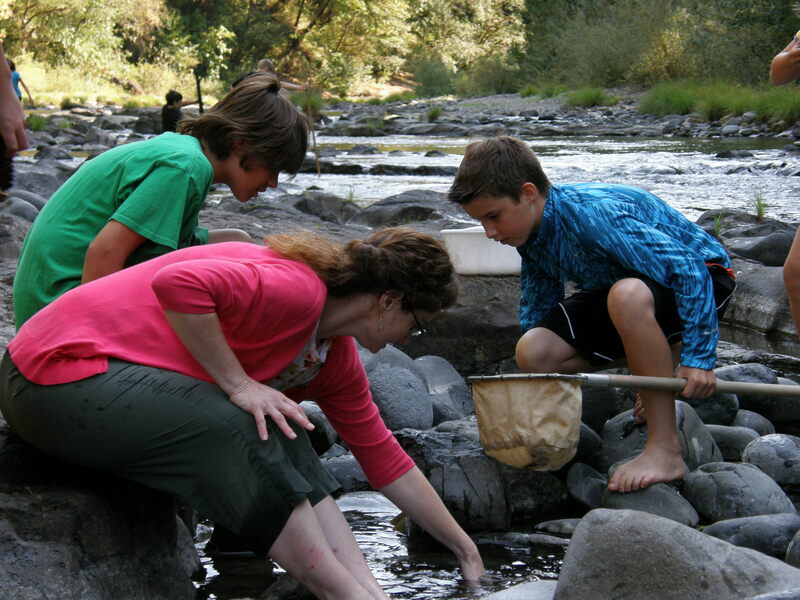 In 2014 the Linn-Benton Salmon Watch Steering Committee hosted over 1,000 students from ten schools on the North and South Santiam and Alsea rivers, to learn about rivers, fish and wildlife. If you would like to learn more, please visit the Linn-Benton Salmon Watch web page. The program is powered by volunteer instructors — we would love to have you help us out! You can sign up for volunteer training and fall Salmon Watch field trips at the website. Supporters include Siuslaw National Forest, Corvallis School District, Calapooia Watershed Council Education Fund, ODFW, Marys River Watershed Council, Oregon Sea Grant, Benton Soil & Water Conservation District and Bluebacks Chapter of Trout Unlimited.